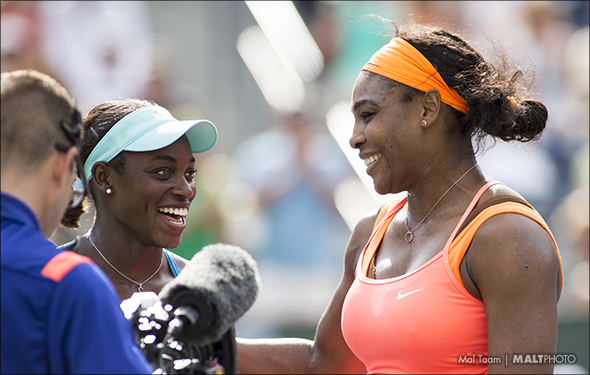 Serena vs Sloane: The Picks, Roland Garros. Does Stephens has a real chance? Obviously Victoria Azarenka was very upset at a line call at 5-4 in the second set, when she hit a heavy ball on the line but Serena argued that it was a late call of out. The umpire inspected the mark and saw that the shot was good, but the point would be replayed. Vika was very angry. Yes, maybe Azarenka could have woken up again or feel confident, believing that she can finally beat Serena at a Grand Slam, but she did not. Because really, Williams was down 2-4 in the second set and then she knew she had to step on the gas and she did, grabbing 10 of 12 games and winning 3-6 6-4 6-2. She was down 0-2 in the third set, and then she found the lines quickly and the upset Azarenka was erratic. She seemed to be dreaming and she lost six straight games. She was out-hit, pure and simple and, if Azarenka can ever beat Williams, she will have to stay there every second, because at the Slams – in fact at every tournament – you can never give in. To a degree in Paris on Saturday, she did not. Williams will play Stephens, who played the best match all year by blowing out Tsvetana Pironkova 6-4 6-1. Stephens says that she loves the red clay, and she shined here, having reached Roland Garros at the fourth round, four years in a row. She is only 22 years old, and she still has a long way to go, but she has reached into the second week at Paris once again and she can really play. Without question, she is super fast, she can crack off both wings and she can mix up her first serves. But at times, she will push the balls, waiting for mistakes, which is why she almost disappeared during the past year. Stephens likes to start slow during the points and when her foe pushes the balls into the center and short she can attack, but against Williams she has to try and dictate from word go. Williams not only can dominate with her giant serves, but if she is feeling good she can attack immediately off Stephens’ second serve. She won’t give her room. If she has any real chance, she has to be comfortable and lock it in, because after Stephens shocked Serena in the quarterfinals at the 2013 Australian Open, they battled off the court and since then, Sloane has become very shy. She has to get in her face. But she won’t again as Serena will win in straight sets. The Italian has been one of the most consistent on clay over the past five years or so and she really took it against Andrea Petkovic, winning 6-3 6-3. She is pretty small so she cannot over power her opponents, but she can grind it against almost anyone. That will occur against Julia Goerges, who beat Irina Falconi 6-4 6-1. Goerges can smack her forehands, but she can disappear during key moments. She will at RG and Errani will reach it into the quarters once again. Once the Czech gets into the match, then she is just fine. She was very clean in besting Irina Begu 6-3 6-2, and now she was to figure out the Swiss, Timea Bacsinszky, who was very accurate in beating Madison Keys 6-4 6-2. Bacsinszky will try to mix up her attacks, but the big lefty Kvitova can go every which way but loose. The two-time Wimbledon champion will win in three sets, but there will be some long rallies. How, who and why? The unknown Van Uytvanck of Belgium beat Kristina Mladenovic 6-4 6-1, and the totally unknown Andreea Mitu of Romania overcame Francesca Schiavone 7-5 6-4. Van Uytvanck has played well during the qualifies, while Mitu seems to love clay as she has played a ton of tournament. A true pick’em here, but Mitu is more comfortable on the clay and will win in three sets. 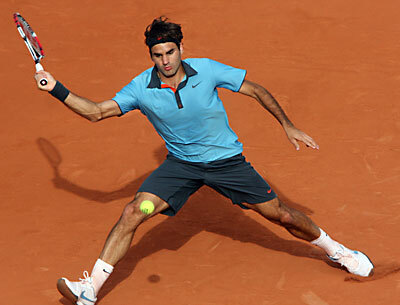 ROLAND GARROS May 30 – Roger Federer mixed up his entire game to beat the unknown Damir Dzumhur 6-4, 6-3, 6-2. He stayed back, he went to the net frequently, he swung hard, he threw a bunch of drop shots and he leaped high to put away his drop shots. The guy had little chance to upset the Swiss, and Federer knew it, so essentially he practiced. Federer is Dzumhur’s idol and he was just happy to be out there. The 18-time champion Federer will face Gael Monfils, who won two five setters, the 13th time at RG. That is a lot. Fortunately, it will only be in the fourth round, so he couldn’t be exhausted after 3 hours or so. Federer has owned Monfils at the RG, beating him three times, which we never really close except in four sets in the semifinal of 2008. But during the last eight months, it’s change a bit, or a lot of bit. At the US Open, Federer had to come from two sets to defeat Monfils. But in the Davis Cup final, Monfils was out of his head, crushing the Swiss on the clay in straight sets, perhaps his best match ever. In Monte Carlo in April, the Frenchman took Federer again and you could tell that her was giving him fits. He changes constantly. So now on Sunday, Federer could become frustrated very quickly. Federer has looked just fine, winning the three rounds without sweating, but now on Phillip Chatrier where it could be raining and dizzily and he is going to have to be very patient. The same goes with Monfils who can be way up, and way down. Federer knows that it will be difficult. Jo Tsonga made it through to the fourth round and will face Tomas Berdych, who hasn’t lost to anyone outside of the top 10 this year. Tsonga used to be in the top 10, but he has been injured during much of the fall and part of the season, but he is back now. Tsonga says that he is playing better and better and he has a chance, but in order to win, he is going to have to dominate his serve and forehand. Plus he is going to run extremely fast. It’s early at Roland Garros, but there were tears. 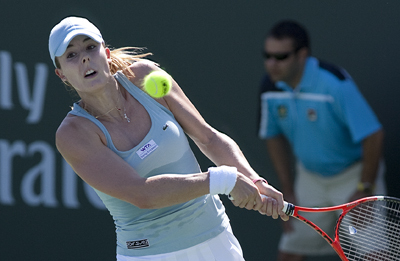 Alize Cornet beat Mirjana Lucic-Baroni 4-6 6-3 7-5 and wept, as it’s the first time ever she reached the fourth round. “It’s magic” she said. If she can reach the quarters she will have to play better as Elina Svitolina is rising. Then the defending champion Maria Sharapova beat Samantha Stosur 6-3 6-4. The Russian has a bad cold and she was fearful, even though she is now 15-2 against her foe. “I knew it was going to be a tough one going into the match,” Sharapova said. “And considering the start of the week was really tough. I knew I had a tough opponent, and I just wanted to be as ready as I could. I was really happy to win it.” She will play the lefty Lucie Safarova in the next round, which could be very close if the Czech steps in early. Flavia Pennetta has said that she might retire at the end of this year, or she may not, but what she does know is she is very good and doesn’t get too nervous. Pennetta downed Carla Suarez Navarro 6-3 6-4. The Spaniard has played well this year but she had a real shot to make it in the quarters and now she didn’t. That will really hurt. … Speaking of which, another Spaniard player, Garbine Muguruza, scored a huge win and upset Angelique Kerber 4-6 6-2 6-2. The powerful Muguruza can take down Pennetta, but she will have to understand which way the bounces are going. Ekaterina Makarova has been pretty darn good over the past year, having reached the US Open semi and the Australian Open semi. She has made it into the fourth round, which made her happy considering that she hasn’t loved clay overall. She beat her good friend and doubles partner Elena Vesnina 6-2 6-4 and now will play Ana Ivanovic, who blew out Donna Vekic 6-0 6-3. That is a toss-up. The 2008 RG champ is happy now again, but she hadn’t done much since the start of January, but she is thrilled she won three straights matches. Ivanovic can grab the match, but she has to be smart and not panic at all. US women rise up as Serena, Keys, Stephens get through. ROLAND GARROS, DAY 5: A couple of days ago, a bunch of the US women went down and a number of people shook their head. Are the Americans would be out very soon? Yes, some disappeared, by three of the top competitors are still there and they should be, given that one of them have grabbed 18 Grand Slams, and two of the youngsters have made it to the semifinals at the majors. The US women had a terrific day with Madison Keys crushed Belinda Bencic 6-0 6-3 , Sloane Stephens beat up Heather Watson 6-2 6-4 and Irina Falconi (who has not made it to a second week yet but she has a shot) clapped her hands and beat Sesil Karatantcheva 3-6 6-1 6-2. Oh and let’s not forger that No. 1 Serena Williams overcame Anna-Lena Friedsam 5-7 6-3 6-3 in a difficult contest. Guess who she will play next? Victoria Azarenka, who beat Lucie Hradecka 6-2 6-3. That will be extremely close, just like in Madrid that the American won 7-6 in the third. “There is no question you have to come up with your A game and play well,” Azarenka said. And how. Keys say that it’s slower, perhaps because it isn’t very warm. Do you like marathons? In 2011, Francesco Schiavone beat Svetlana Kuznetsova 6-4 1-6 16-14 at the Australian Open in 4 hours 44 minutes. This time in Paris on Thursday Schiavone inched past Kuznetsova 6-7(11) 7-5 10-8 in 3 hours, 49 minutes. It could happen again, sometime in the road. “She is amazing, and every time I play against her I say, Oh, my God, now what can happen? “ Schiavone said. Julia Goerges beat Caroline Wozniacki 6-4 7-6(4), no surprised that the German has troubled her on the clay years ago. But once again the former No. 1 couldn’t find a way to improve a great deal on the clay. Will Wozniacki be comfortable at Wimbledon? She has not performed very well on the grass at Wimbledon either. She needs to change it up. The American Jack Sock played a very tough matches and he overcame Pablo Carreno 6-7(2) 7-6(4) 6-1 7-6(4). Since the fall, he has made tremendous strides. He will face the 18-year-old Borna Coric who bested Tommy Robredo 7-5 3-6 6-2 4-6 6-4. Both of the youngsters will blast away. Bernard Tomic was up 5-2 in the fifth and it appeared that he was more consistent, but then he backed up. His 19 year old other Aussie Thanasi Kokkinakis beat Tomic 3-6 3-6 6-3 6-4 8-6 and now he gets to face Novak Djokovic, who beat Gilles Muller 6-1 6-4 6-4. Kokkinakis has said that he can’t wait to play the No. 1 so even if he’s a little tired be will be enthusiastic. Rafa Nadal is cruising along, crushing Nicolas Almagro 6-4 6-3 6-1…Goof for the US Open champ who appears to be health again, when Marin Cilic beat Andrea Arnaboldi 7-6(3) 6-1 6-1…Now her comes another cracker, when another Aussie, the fiery Nick Kyrgios will play Andy Murray. Phillip Chatrier please. ROLAND GARROS, DAY 4: Two years ago, Simona Halep wasn’t much at all. She was out of the top 60, she wasn’t able to beat the best players and it appeared that she would stay middle of the road. But after she lost early in 2013 Roland Garros, she perked up, changed her tactics, she was willing to take risks. She no longer just pushed the ball around and she was willing to try and hit the lines. The Romanian decided that right now she was going to be consistent – left, right, down the middle– anywhere. For the most part, she gave it all, winning week after week at the small tournaments, but she was gaining and by 2014, she was already there. She reached the final of Roland Garros, nearly beating Maria Sharapova, but she lost 6-4 in the third when the Russian flew away, grabbing the last eight points. However, the world began to know who she was and now it looked like that the 23 year old had a real chance to win at the major. But unfortunately, she has stopped at the Grand Slams. She has looked lights out at a number of WTA tournaments, like winning Bucharest, reaching the WTA Final, winning Shenzhen, Dubai and Indian Wells. But at the Grand Slam, she has been so-so. She looked pretty good at 2014 Wimbledon, reaching the semifinal and she had a legitimate show to reach the final, but she was out-stroked against Genie Bouchard. Then at the US Open, the veteran Mirjana Lucic, who has rarely gotten deep, stunned her. In 2015, she thought she was ready to charge at the Australian Open, but as she admitted later, she didn’t feel right mentally and she loss to Ekaterina Makarova 6-4 6-0. On Tuesday in the second round of the Roland Garros, Lucic beat him again, in straight sets, where she wasn’t feeling the ball. As she said, she needs to fix things, but she doesn’t really understand why she isn’t playing cool and precise at the Grand Slams. But outside the court, she will think about it deeply. Because if she doesn’t, she will never win a Grand Slam. Notes on a Draw Sheet: Taylor Townsend struggling, now working with coach Donald Young Sr.
ROLAND GARROS, DAY 3 — The American Taylor Townsend is now working under her old/new coach Donald Young Sr (his son is Donald Jr.). 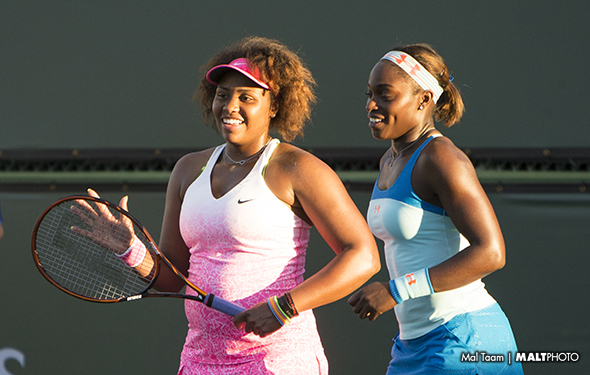 Townsend – who lost in the first round at RG — grew up in Atlanta, where the senior Young taught her when she was a kid. Now, she is returning to the Peach State. Townsend was working in Florida with the USTA for a few years and now she wants to try Young once again. Townsend was also been hitting with Zina Garrison last year, who lives in Houston. It sounds like she is trying to settle down. In March, she had a stress reaction in her ankle and she had to wear a boot for a couple of weeks. She hadn’t played until early May as she was out for two months. When she was out, she was sitting around and knew she had to make some change. Currently ranked No. 130, Taylor is only 19 years old … so she has a long way to go. She is very strong and has a lot of variety, but at times she isn’t sure which way she is going. Last year, Townsend reached the third round at Roland Garros when she stunned the Frenchwoman Alize Cornet. She was only 18 years old and it appeared that she was ready to climb. During last summer she qualified at Washington and Cincinnati, but, in the US Open, she had to face Serena Williams in the first round and she was crushed 6-3, 6-1. After that she lost her touch. This year, she hasn’t won much at all, falling to Caroline Wozniacki twice and against Sam Stosur. Her long-term goals is, “Top 10, Top 5 and win all the Grand Slams several times.” That is ambitious, but the 2012 Australian junior champion has a long way to go. She wasn’t progressing, so now she is hoping that she will be better, and soon. The US Open champion Marin Cilic says he is finally hitting the ball well again. The Croatian has been hurt since last October and he just started back on court. He won his first match at RG. A number of people have forgotten that he is even here. Caroline Wozniacki says that the courts at RG have changed, at least a little bit. She likes the colors on court. Rafael Nadal has come into the French Open for years insisting that he should not be called the favorite. That he does not go into matches confident of victory. That he is only practicing hard, doing his best, looking to be competitive. And all the while, onlookers would dismiss his remarks and — usually correctly — all but hand him the trophy before the tournament even began. Now, there is no need for Nadal to say any of this. He is not the favorite, not confident, just looking to stay competitive. Now is when he might want to sound circumspect. But he has done the opposite, dropping his usual modesty to assert his abilities and insist he is still the same player. It looks like the only way to get Nadal to be confident might be to lack confidence in him. Having heard the Spaniard downplay his success for so long, it’s quite a change to hear him talking up his chances. But that is what the now No.7-ranked player now finds himself having to do. With just one minor title on clay and no trophies at the European events coming into the French Open, he has had to strike a different note than when he was on an unbeaten or almost unbeaten run. Instead of arguing he hasn’t been cruising, the 28-year-old now argues he hasn’t completely collapsed. “I think I can do it. Then do it is another thing. I’m going to try my best, and I think can happen,” he said. And if nothing else, Nadal notes, he has already won a record nine titles at the tournament. “Obviously winning nine times here is difficult to equal,” casually mentions the all-time great, though he is not usually one to talk a lot about his impressive record of achievements. The new, defiant Nadal doesn’t sound like the familiar, unassuming one, but the circumstances have changed more than he has. His position now is not that different from his position in previous years. Anything can happen, he would say. Anything can happen, he says now. Like many established champions before him, Nadal no longer has as firm a grip on victory, but it is still within his grasp. One thing, though, has changed. Nadal might not be playing as well as before, but he’s talking a better game than he ever used to do. The US women entered Roland Garros with 17 players, two of whom has lost on Sunday at the bottom half when the teenager Louisa Chirico lost to No. 9 Ekaterina Makarova and Lauren Davis fell to Mirjana Baroni-Lucic. There are only two players left in the bottom half, Nicola Gibbs and Madison Brengle. In the top half, No. 1 Serena Williams is favored, but most of the rest of the players have a chance to make it into the second week. However, four of the US players will go up each other and both will be extremely close. 1-Serena Williams vs. Andrea Hlavackova: Williams is the favored wherever she goes but this could be a tricky contest, as the Czech has been round for quite a while now and she once made it to the fourth round at 2012 US Open. They know each other though, so Williams won’t be nervous and will batter her by reaching the second set. Alexa Glatch vs. Anna-Lena Friedsam: Glatch qualified here, which was very good but not a stunner given that in six years ago in the Czech at Fed Cup she knocked out Iveta Benesova and then surprise, surpise, she shocked the young Petra Kvtiova. Glatch has more experience now but Friedsam from Germany is an up and comer. 15-Venus Williams vs. Sloane Stephens: This is a big contests between the two Americans, with the 34-year-old Venus who has been around for a very long time and the 22-year-old Stephens — who has reached into the second week twice at Roland Garros – is growing up. Stephens has played a bit better last week by reaching the semis in Strasbourg, while Williams started slowly on clay, easily losing to Victoria Azarenka and Simona Halep in Madrid and Italy. Venus Willaims and Stephens have yet to face off, but Venus has watched Sloane and Serena go at each other hard and who have been extremely dramatic. Venus will try to back Sloane near to the wall. 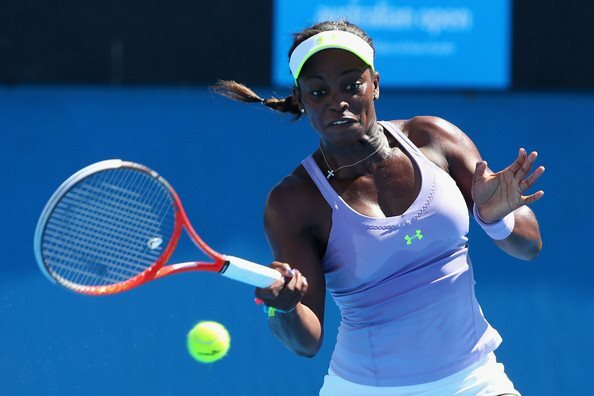 Sloane will attempt to yank Venus way wide. If they both play very well it can end up being the most exciting contest in the first round. Shelby Roger vs. 10-Andrea Petkovic: The German Petkovic is clearly favored, but the German has been hurt over the past months so she is vulnerable. It’s up to Roger to hang in there and when she gets chances she must go for it. Christina McHale vs. Loudes Lino Dominguez: McHale qualified at both Madrid and Rome so clearly she is finally healthy once again. She is very steady on the clay and should be able to out run Dominguez. Alison Riske vs. 17-Sara Errani: Over the past two years Riske has improved quite a bit. While she is substantially better on grass and hard courts, Riske can give the Italian trouble if she is super patient because Errani is very tricky. Irina Falconi vs. Manon Arcangioli: Falconi hasn’t played singles on clay, but overall she has hung in there this year and should be able to out last the young Frenchwomen, who is a wild card. CoCo Vandeweghe vs. Julia Goerges: Over the past year, Vandeweghe has been much more consistent and she is much better reading her play. However Goerges has been very good on clay and can dictate her heavy forehand, so in order to win, the American has to make sure she cracks her first serve and jump on her returns. Bethanie Mattek-Sands vs. 30- Irina-Camellia Begu: Mattek-Sands was out due to an injury that last six months in 2014 and while she has been on fire in doubles, she has struggled in singles. However, if she can contain herself and make sure that the Romanian is unsure which way she is going she will have a real chance. Taylor Townsend vs. Tereza Smitkova: Townsend is still very young and she has a lot to learn, but when she is feeling it she can overpower from both her opponents. However, the young Czech Smitkova has potential too so the result will be extremely difficult. 16-Madison Keys vs. Varvara Lepchenko: Keys has been very good when she has been on this year, but she’s been so-so when her body was aching. Lepchenko had cracked the top 30 once again but the fellow American Lepchenko has been hurt since the end of January. However, she feels much better and she can be an excellent clay lover. This is a true pick-em, huge serves by Keys and heavy left-handed by Lepchenko’s. Nicola Gibbs vs. Alexandra Dulgheru: The former Stanford standout has gradually improved the past year and if she can keep the balls deep then she might be able to frustrate the experienced Romanian. Madison Brengle vs. Samantha Stosur: Brengle has a had a terrific year for the most part, but she hasn’t figured out the clay yet. Stosur has reached the RG final before so unless she if off, Brengle will have to pull off her biggest clay court win ever. In 2006, the last great U.S. player Andre Agassi retired and there were no competitors left who still loved the clay. Agassi won Roland Garros in 1999, and the other fantastic males had grown up together on the hard courts and very quickly, they learned how to play on the clay. Michael Chang won Roland Garros when he was just 17 years old, shocking the world in 1989. Jim Courier pounded his forehand into the corner and he won two straight titles in 1991 and 1992. His best players, the 14 Grand Slam champion Pete Sampras never reached the final on clay in Paris but at least he reached the semifinal in 1996. But when the American’s Big 4 retired, only Andy Roddick had won a major, winning the 2003 US Open, so it looked like he would change it up and go deep in Roland Garros. But he could not manage to reach a quarterfinal. Two of the top 10, James Blake and Mardy Fish, couldn’t do it either. This current US males group would love to reach the second week in Paris, but they have to play extremely well from the outset because everyone they are facing are either ranked in the top 32, nearly ranked or coming soon. No. 16 John Isner vs. Andreas Seppi: Isner is favored but Seppi stunned Roger Federer at the Aussie Open. Dangerous. Jack Sock vs. No. 10 Grigor Dimitrov: The Bulgarian Dimitrov hasn’t played well at all this year but of he is on, Sock is going to have to be very patient to win it. Sam Querrey vs. Borna Coric: Querrey is super aggressive, but so can the 18 year old Croation also be able to bomb away. Donald Young vs. Santiago Giraldo: The Columbian cracked the top 30 last year and while he has slipped this year, Young will hang in there for hours to best Giraldo. Steve Johnson vs. No. 27 Guillermo Garcia Lopez: Johnson has improved over the past two years on clay, but if he can upend the Spaniard he will have to play very aggressive. 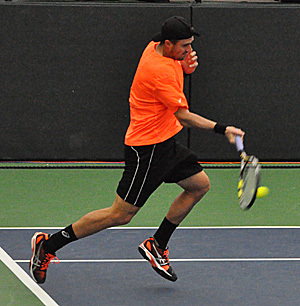 Tim Smyczek vs. No. 15 Kevin Andersons: The tall South African doesn’t love the clay but he is consistent on every surface, which means that Smyczek has to run him as much as possible. Frances Tiafoe vs. Martin Klizan: Another teen, Tiafoe, has potential and he looked pretty good on the hard courts, but in order to best the No. 35 Klizan he must return very well to take him down. Roland Garros Draw, the men: Big 4 of Djokovic, Nadal, Federer & Murray favored, but who gets knocked out before the semis? Of course Novak Djokovic will easily reach the semifinals right? I mean he has always been right at the top, having reaching at the semis or better during 18 of the last 19 Grand Slams. Unfortunately he could draw the nine-time Grand Slam Roland Garros champ Rafa Nadal in the quarters. As Roger Federer said, it doesn’t really matter as one way or another you have to confront the best, whether early in the second week or late at the end. While that is true, both No. 1 Djokovic and No. 6 Nadal could be super nervous early on and your head was spinning around until he falls down. Regardless, the two should reach the quarters, but there are some potholes. Djokovic could face Bernard Tomic in the third round and while the Aussie doesn’t love clay, he has a lot of tricks in his bag and push him to five sets. However, Djokovic knows how to wear him down. He should face Richard Gasquet, who has been hurt this year (again!) and while the Frenchmen has played extremely well at times on RG, he has also slips away and Djokovic will grab it in four sets. Then he will face Nadal and of course it will be very close. Nadal was better every time at RG as he punished him with high-hopping forehands that nearly knocked him down. However, Nadal has to get there and while he has dominated at RG since 2005, he was struggled this season. But at some point in 2005, Nadal will rise again and it will occur right here. He will face Nicolas Almagro in the second round and will out think him – again. He could face the Frenchman Adrian Mannarino in the third round who is flashy, but he is not that consistent. Now comes a tricky part: Nadal might face Jack Sock in the fourth round who hasn’t been able to upset Nadal on clay, but the American is ready to shine and he will upset Grigor Dimitrov in the first round, as the Bulgarian has been all of the place this season. The US men have a tough draw;Sam Querrey has to play against the teenager Borna Coric in the first round. The Croat Coric will out-steady Querrey, but he will lose to the veteran Tommy Robredo, who will face Sock in the third round, but then the Spaniard Robredo will fall to Sock in a marathon. Complicated enough? Then Sock will have to go up against Nadal and will look good in the first set, but his legs will be rubber and Nadal will dash away. Nadal and Djokovic will face off for the sixth time in Paris. Last year in the final at 2014 RG, Rafa won 3-6, 7-5, 6-2, 6-4. Without question, Djokovic has played better this year by a long shot. But until Nadal actually loses, he remains the favorite until he finally faded away. He hasn’t yet and Nadal will reach the semifinals again. Andy Murray has a tough draw, assuming the kids get through. The Brit might have to go up against the super powerful Nick Kyrgios in the third round, but believe it or not, another Brit, the qualifier Kyle Edmund may play the Aussie in the second round. One would think that Kyrgios will overpower Edmund, but the Aussie gets hurt frequently and Edmund might have to go up against the wise and older Murray. Quality wise, Kyrgios will reach the third round and he and Murray will swing away at each other. Kyrgios – who upset Federer in Madrid – is coming up fast and he has a lot of weapons, but Murray will out think him. John Isner will play Andreas Seppi in the first round, who shocked Federer at the Australian Open, so that’s definitely going to go into the fifth set, but the American will grab an early break and win it. If he doesn’t snare a break early, then they could continue until 60-60 when someone collapses and they have to drag him off the field. Murray knows exactly how to play against Isner so he should be able to win in four sets. In the quarters, it will be be David Ferrer, who is very steady. It would be nice to see the US Open champ Marin Cilic begin to play well again, but he is still trembling and Ferrer will grind him. Yes, Ferrer could out-last Murray, but the Scot is much more aggressive on clay these days and he will pound the heck out of him. Kei Nishikori has been good but not great this year. Fortunately, he should be able to reach the quarters, but there will be some clay lovers, namely against Fernando Verdasco in the third round and Roberto Bautista Agut in the fourth round. Nishikori won’t be afraid of going after Verdasco’s huge forehand, and won’t dive into a marathon rallies against Bautista Agut. Then he will have to confront against Tomas Berdych, who believe it or not, he is now ranked No. 4. The reason is because this year he has been smarter and steadier. He will trash Fabio Fognini and Jo Tsonga (who has also been hurt all the time) who won’t know where to hide. 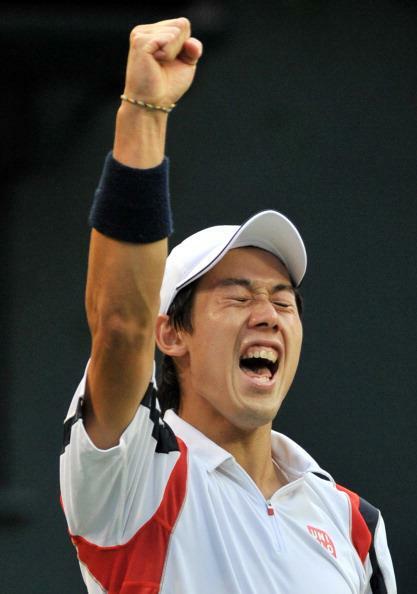 The 25-year-old Nishikori has said that he is ready to win a Slam now. Well, first he has to beat the Big 4 consistently, which he has not. However, at least he is confident and willing to make risks. Berdych will push him into five sets, but in the end, Nishikori will steal the show and reach the semis. Roger Federer has been around forever, in fact, he had great years, so while the other Big 4 have tougher draws, that does not mean that the Swiss could go down somewhere because everyone wants a piece of him. The 33 year old could lose a couple sets against Alejandro Falla (remember Wimbledon) and Marcel Granollers (a big servers) but in three out of five sets on clay, it’s not going to happen. Even if Ivo Karlovic reaches the third round, even after he is nailing ace after ace, he cannot chop his backhand that gives Federer trouble. But in the fourth round, that can be tricky because he could face Gael Monfils, who crushed him at the Davis Cup. But what is Monfils doing this year? Not much. Yes, the Frenchman has played a couple of great matches in RG, reaching to the semis twice, but he lost to Federer and he wasn’t really there. At least this time he should be fresh as it will only be the fourth round and he won’t be exhausted. Monfils should have to face Pablo Cuevas, which will be very difficult as he can run and run for hours. Monfils loves Paris and he can edge over Cuevas, but while Federer has been up and down this year, he did just reach the Rome final and he is playing better. That is why Federer will stop Monfils in five terrific sets. After that, Federer will play his good buddy Stan Wawrinka in the quarters, which he just wasted in Rome. Once again, Federer will get into his head and will win easily, reaching the semis. Roland Garros Draw, the Women: Will all the top 4, Serena, Sharapova, Halep & Kvitova get through? Top seed Serena Williams may be the favorite, but she has one of the most dramatic draws in memory. She could face the former No. 1 Vika Azarenka in the third round, when the Belarussian has matches against the American in Madrid and she began to shake and lost. Obviously, Serena was more aggressive and she didn’t panic, while Azarenka did. However, Azarenka believes she can come very close against Williams and this time, if they meet each other again she has to hit the lines immediately. Azarenka will be right there again but Serena will nail a few big aces and win it. Assuming Serena Williams reaches to the fourth round, she could face her sister, Venus, who goes up against Sloane Stephens in the first round. That is a pick-em right there as neither have been played great in the last two months. The younger Stephens did play OK this week in Strasbourg until she got blown out in semis against Sam Stosur, losing 6-0 in the third set. Whether it’s Venus or Stephens, Serena will win but it could be stressful. Serena might have to play her great friend Caro Wozniacki in the quarters, but the Dane has a long way to go on clay. It could be Andrea Petkovic, Sara Errani or Jelena Jankovic, assuming they are healthy, which is a big if. As Serena says, she struggled last year in Paris and she knows that if she is going to go deep again that she has to be healthly. It won’t be easy, but Serena will make it to the semifnals. No. 4 Petra Kvitova is the favorite to reach the semis, not because she has been fantastic on red clay, but she played extremely well in Madrid, winning the tournament and running around as fast as she could and keeping the balls inside the box. This won’t be easy though. She might have to face Irina Begu in the third round, who can clock her strokes. She might have to play Madison Keys or Timea Bacsinszky in the fourth round, both of whom who went very deep this year and who won’t be afraid. Keys or Timea Bacsinszky can take out Kvitova, but you have to start very early because once she gets rolling, she is very hard to stop. If the Czech reached the quarterfinal, it is between anybody’s game. Gene Bouchard is ranked No. 6, but she hasn’t played well all year, with the exception of the Australian Open, when she made it until the quarters. But now, everyone has been able to watch her break down. Yes the Canadian can be very close against Kristina Mladenovic in the first round, but the Frenchwoman can torch her, going strong and deep. The two others, Karolina Pliskova and Svetlana Kuznetsov, are ripped to reach the quarters. While Pliskova has looked very good this year for the most part, but not on clay. Kuznetsova looked spectacular in Madrid and she did win RG back in the day in 2009, so when she is feeling right she can power into the quarters. And then again, Kvtiova was hitting her spots into the corners in Madrid and she will doing it again reaching the semifinals. It would be great if No. 7 Ana Ivanovic reaches the semifinals and then the 2008 champion just might recall that she never grew nervous that year. But she was a baby then and now she is thinking that she is deep into her head, especially this year where after she reached Brisbane in the final at the start of the year she became extremely nervous. Here at RG, perhaps the Serbian will make it by the third round but then the Frenchwoman Caroline Garcia will take her out. The No. 31 is not perfect by any means this year but on clay on Paris, she will shine, reaching into the quarters. But who will face her there? No. 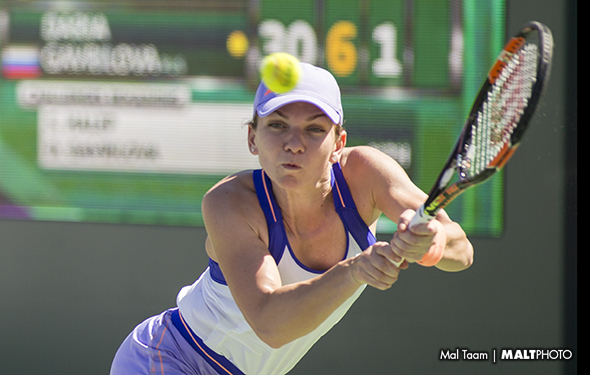 3 Simona Halep, that’s who. Yes, the Romanian was so-so at Madrid and Rome, but she wants to return again into the RG final. Last year not many knew her and she nearly won the tournaments against Maria Sharapova. This time, everyone knows her. She will have to work hard against Alize Cornet in the third round and the same thing against No. 19 Elina Svitolina in the fourth round who will upset No. 14 Aga Radwanska, but she will outlast her to reach the quarterfinals. However, even though Halep can be afraid at the Slams (look at how she stopped at the 2014 US Open and 2015 Australian Open) she will be able to dig deep and run past Garcia to reach the semis. Can anyone else knock out the top 4 and reach the semis? Nope, although everyone is vulnerable. The defending champion Maria Sharapova will face a tough draw. She has to open against the huge server Kaia Kanepi, but she isn’t fast enough. Yes, Sam Stosur has been very tough at Roland Garros, once reaching the French final, but she will have to play lights out to stun the Russian/American. Sharapova knows how she will hurt Lucia Safarova on her backhand in the fourth. In the quarterfinal, Sharapova knows she will have to mix up her shots in order to win. In all probability, she will face Carla Suarez-Navarro in the quarters, but who really knows as the Spaniard might have to play against Flavia Pennetta in the third round and possibly go up against her fellow countrymen Garbine Muguruza or the German Angie Kerber (who beat Sharapova at Stuttgart). All of those four love clay and thrive on it. If Sharapova has a bad day, she can fall against the Spaniards, the German or the Italian, but Sharapova has reached Roland Garros in the final in 2012 (d. Errani), 2013 (l. Serena) and 2014 (d. Halep) and she knows exactly what is coming. She will reach the semifinal again and handily.